» PMOLED vs AMOLED - what's the difference? PMOLED vs AMOLED - what's the difference? 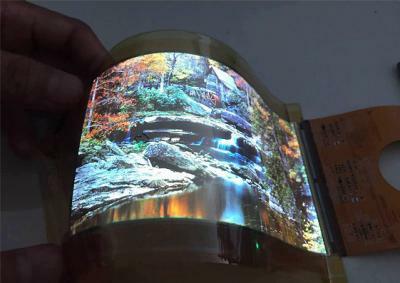 OLED is an emerging technology for thin, efficient and bright displays. There are two types of OLEDs: Passive-Matrix (PMOLED) and Active-Matrix (AMOLED). This article explains the difference in both the technology and the applications. OLEDs are made from organic light-emitting materials that emit light when electricity is applied. OLED displays are emissive - and do not require any backlight or filtering systems that are used in LCDs. As a result, OLEDs can be made flexible and transparent while providing the best images possible. There are two types of OLED displays - PMOLED and AMOLED. The difference is in the driving electronics - it can be either Passive Matrix (PM) or Active Matrix (AM). A PMOLED display uses a simple control scheme in which you control each row (or line) in the display sequentially (one at a time). PMOLED electronics do not contain a storage capacitor and so the pixels in each line are actually off most of the time. To compensate for this you need to use more voltage to make them brighter. If you have 10 lines, for example, you have to make the one line that is on 10 times as bright (the real number is less then 10, but that's the general idea). 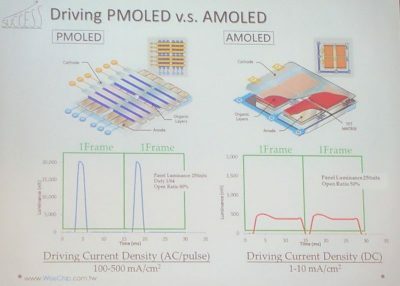 So while PMOLEDs are easy (and cheap) to fabricate, they are not efficient and the OLED materials suffer from lower lifetime (due to the high voltage needed). PMOLED displays are also restricted in resolution and size (the more lines you have, the more voltage you have to use). PMOLED displays are usually small (up to 3" typically) and are used to display character data or small icons: they are being used in MP3 players, mobile phone sub displays, etc. An AMOLED (Active-Matrix OLED) is driven by a TFT which contains a storage capacitor that maintains the line pixel states, and so enables large size (and large resolution) displays. AMOLEDs can be made much larger than PMOLED and have no restriction on size or resolution. 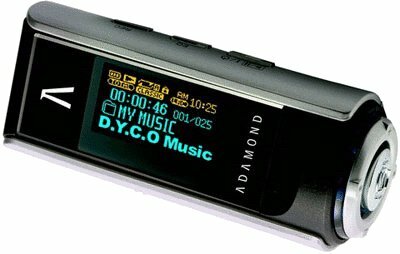 The first OLED products in the market used PMOLEDs - these were MP3 players, sub-displays on cellphones and radio decks for automobiles. The displays were small and usually with just one or two colors. AMOLED panels started to emerge in 2007, and today these displays are adopted in smart phones, cameras, tablets, laptops and TVs. The AMOLED market is dominated by Samsung Display and LG Display, and in 2016 it is estimated that over 300 million AMOLED panels will be produced. The PMOLED market is a lot smaller, and more fragmented. 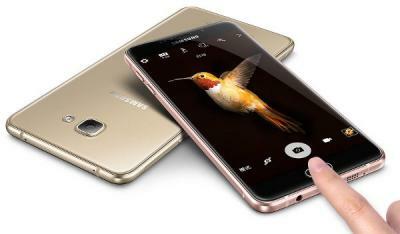 If you are interested in adopting a PMOLED or AMOLED display in your next device, we're sure you'll find our comprehensive OLED catalog, the OLED Marketplace interesting.